These are examples of subtraction and addition pumpkins. This is a great spare-time or centre activity for practising adding and subtracting. 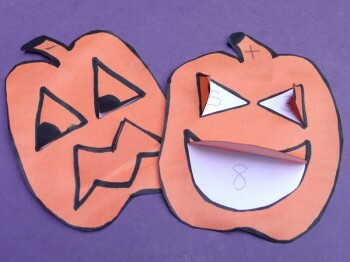 The pumpkin faces are easy to make and program with the number sentences that you want students to practise. Students may help to cut out more pumpkins when needed and the teacher can print new number sentences on them. They may even be taken home for practise. **This can be adapted for multiplication or division use. ***Other seasonal ideas for using this concept include Santa faces, snowmen faces, Easter bunny faces, Valentine heart faces, March leprechaun faces. Halloween Pumpkin Worksheet showing 6 different pumpkin faces (see below). Print out a white master copy on an 8 1/2″ X 11″ sheet. I cut the orange construction paper into 8 1/2″ X 11″ size, for as many pumpkins as I want to make, maybe 5 or 10 copies to start (makes 30 or 60 pumpkins). With the white master Worksheet under the lid, photocopy pumpkin faces onto the orange paper, feeding the orange sheets in one at a time. Use X-Acto knife to cut open eye and mouth flaps. Glue outside edge of the orange pumpkins onto the white pumpkin backings. Teacher prints number sentence on each pumpkin. (See below for a sampling of lists for addition and subtraction number sentences that can be used. For example, 3 goes on left eye, 9 goes on right eye and the answer 12 goes on the mouth. Students open the left eye and say “3 plus” then open the right eye “9 equals”, then answers “12” before opening the mouth flap and checking their answer.) I put “+” or “-” on the pumpkin stem to make it easier to “say” the number sentences. Example: 3 “plus” 9 equals 12. Teacher demonstrates how to use the pumpkins, stressing the importance of SAYING the number sentence out loud and figuring out the answer BEFORE opening the mouth flap to CHECK their answer (for reinforcement). Check for class knowledge level before printing up pumpkins. Some classes may not need the 1+… whereas others may need to begin there. **See below for Halloween Pumpkin Worksheet and the beginning of a list of number sentences for addition and subtraction. Lists like this can be found in “The Elementary Math Teacher’s Book of Lists: With Ready-to-Use Patterns and Worksheets ” (page 131 has 100 basic addition facts, page 132 has 100 basic subtraction facts, see pages 133 and 134 for multiplication and division facts). Teachers will test the students for prior knowledge and begin where needed and review where needed.